"Astra" and "Sastra" are terms used in Dhanurveda (military science) to denote two types of weapons. Knife, arrow, spear, club and so on-real weapons-come under the term "sastra". "Astra" is what is energised by a mantra into a weapon. If you discharge just a darbha or a blade of grass chanting or muttering the appropriate mantra it will be turned into a weapon. Sastras are also discharged similarly with mantras. If you hurl something at a object or person muttering the mantra proper to it, the object or person will be destroyed when hit. The twice-born (Brahmins, Kshatriyas and Vaisyas) have the duty of discharging "Astras" every day to destroy asuras or the evil forces besieging mankind. Does not "Astra" mean that which is discharged, thrown or hurled? What is the "Astra" which is to be thrown or discharged [by the twice - born]? We throw water so as to drive away or destroy the demons or evil forces that have taken hold of the minds of people. This water, the astra, is the same as the libation offered during sandhiyavandana. We must keep this purpose in mind when we offer arghya : "May sinfulness and falsehood be annihilated. May the sun of knowledge shine brightly. May those obstacles that keep the sun of knowledge dim in us to be demolished. "Whatever you do or do not do, you must perform this arghya thrice a day. Do it somehow " holding your breath"
When a person does a job earnestly and whole-heartedly, we say that he does it "holding his breath". As a matter of fact sandhyavandana is to be performed holding one's breath. If we do this all the evil forces will be destroyed. Nowadays all we do is to hold our nose with our fingers. 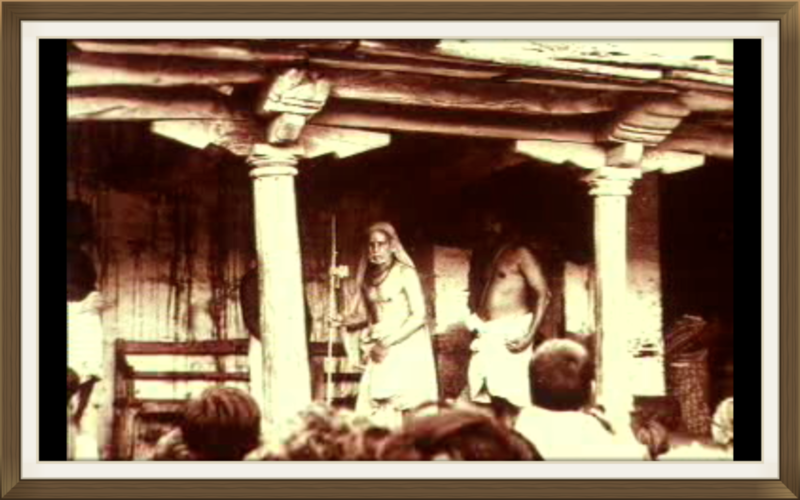 The sastras do not say, "Nasikam ayamya", but say, "Pranam ayamya. " It means, instead of merely holding the nose, control the vital breath, the prana itself or the life force. All work must be done with one-pointedness. There must be such one-pointedness of the mind to turn water into a weapon(astra). The breath is controlled for this purpose. You will ask: "How is it that if you control your breath the mind will be still? " We see that when the mind is still the breath also stops. When our wonder is aroused, when we are grief-stricken or when we are overjoyed, the mind becomes one-pointed. We exclaim "Ha" and the breath stops for a moment. But soon we breathe fast. We do not stop breathing with any effort on our part-the stopping is involuntary. The mind stops when it is enwrapped or absorbed in something. Then we heave a sigh-take a long breath-making up for the momentary stoppage of breathing. We learn from this that, when breathing momentarily stops, the mind becomes one-pointed. This is the reason why the breath is controlled when arghya, libation, is offered. If we practice pranayama we will train ourselves to have mental concentration. This is important to yoga. Practicing pranayama for long is difficult and it must be done under the guidance of a guru. In sandhyavandana we do it only ten times. For some rites it is performed three times as a preliminary step. If we had practiced pranayama regularly from the time of our upanayana we should have become yogisvaras by now. What we do we must do properly. When we practice pranayama as a part of sandhyavandana we must stop our breath for 30 seconds or so, not more. When the vital breath stops, the mind will become still. If the arghya is offered in this state the evil forces will be truly be driven away. The water that we pour or throw when our mind is still will turn a weapon to destroy all evil. After employing the arghya weapon against the evil forces, we must perform Gayathri-japa. Pranayama we must do according to our ability, holding the breath for a while, then realising it: this process may be repeated without controlling the breath for too long a time. All the steps in sandhyavandana- samkalpa, marjana, arghya-pradana, japa, stotra, abhivandana-have for their purpose the blessings of Isvara: this is stated in the samkalpa that we make at first. From beginning to end sandhyavandana is dedicated to Paramesvara and pranayama is an important part of it. According to the sastras even the sick must do pranayama three times a day. This means that breath-control is not such as to cause trouble or discomfort. Indeed it could mean a cure for the illness and a prescription for long life. In abhivadana we mention the name of the sage from whom we are descended. It is our duty to observe Vedic rituals at least for the fact that we belong to the gotra of that sage. After him there have been so many rsis in the line. We use the terms "trayarseyam", "pancarseyam", "ekarseyam", meaning that, in the gotras concerned, there were three sages, fives sages, one sage. . . They must have lived long and secured knowledge, fame, Brahmic lustre and spiritual eminence by performing sandhyavandana. This is what the Manusmrti stanza means. By our neglect we should not sever the thread, the tradition, handed down to us uninterruptedly. We must perform sandhyavandana as an offering to Paramesvara and must do so understanding its meaning and with faith and devotion. There must be one-pointedness in it and no mantra must be left out. We sin with our mind, speech and body. I told you that these sins must be washed away by performing rites with the same mind, speech and body. In sandhyavandana we mutter the mantras with our mouth and, even as we repeat the Gayatri, we meditate on it with our mind and in such rites as marjana (sprinkling of water) we acquire bodily purity. Sandhyavandana is karmayoga, bhaktiyoga and jnanayoga combined [it unites the three paths of karma, devotion and knowledge].